Experience Julius Caesar as a powerful full-cast drama with entertaining and enlightening commentary that explains what's what and who's who as the plot unfolds. To help you get the most out of Shakespeare, the narrator offers historical insights and background information, so you can enjoy the jokes, appreciate the references, and get a real sense of Shakespeare's world. The unabridged drama is also presented without commentary. From the creators of SmartPass audio education study guides, voted third in a national poll to find the UK's favourite audibook (2008). Winners of three Spoken Word Awards for Best Drama (2004), Best Original Audio, and Best Publishing Initiative (2005). 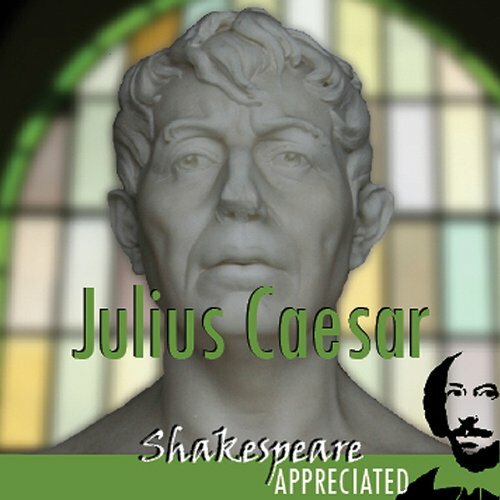 We used this unabridged audio Julius Caesar to introduce our daughter to Shakespeare as a high school freshman. She rather enjoyed the play, had good comprehension of the plot, and agreed that the integrated annotations helped her. I had initially feared that the constant interruptions for annotation would be distracting, and that the additional listening time that they required would be discouraging, but this was not the case at all. The notes provided just enough of a guide to the action (I especially appreciated how it illuminated Mark Antony's crowd manipulation) without getting the listener bogged down unnecessarily with rabbit trails. Indeed helped me to appreciate Shakespeare! This was my first try at listening to Shakespeare and it was enthralling. There's something about listening to the story unfold and imagining the settings and situations that, I believe, engage you more than even watching the play. The commentary was excellent! In fact as a Shakespeare novice, I don't think I would have gotten nearly as much out of it. This was my first listen to a Shakespeare Appreciated production. I love Shakespeare but I am not an expert. So usually for me experiencing a play is more about how wonderful the words sound and the overall story. What was different about this listen was that they stop they provide lots of background up front, during the reading of the play, and after. Insight into things I would have otherwise missed or not understood. I very much enjoyed it and it brought several new dimensions to the play, which I though I knew fairly well. I will be listening to others in the coming months. Just terrific. Enough background and footnote type commentaryso that at no point are you bored or lost. Terrific for the Shalespeare novice. Listen to this and then watch the film or see the play and you will appreciate Shakespeare. My only complaint is that Smart Pass do not have more of Shakespeare's plays available yet in this ingenious format. This audio version is only suitable for children in order to prepare them for a live stage version. The rambling Chatty Cathy interpreting every sentence is most annoying and unnecessary.